Manchester United manager Jose Mourinho said it is "possible" that out-of-contract striker Zlatan Ibrahimovic could sign a new deal. The former Sweden international, 35, was released in June after not being offered a new contract. He has been recovering from knee surgery at United's training ground. Mourinho said: "If the decision is to stay and wait until December - he can't be back until them - why not wait? We are speaking and changing ideas." 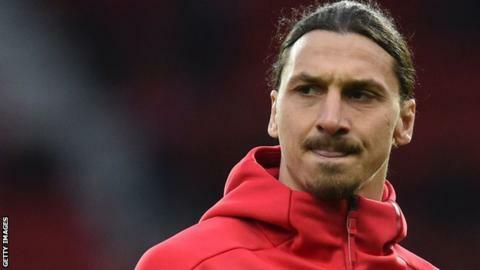 Ibrahimovic signed a one-year deal in July 2016, but an extension was not triggered after he suffered a season-ending knee ligament injury in April. He scored 28 times in 46 games in all competitions for United. Mourinho also said he wants to sign "one or two" more players this summer. United have spent a combined £106m on Benfica defender Victor Lindelof and Everton striker Romelu Lukaku during the transfer window, and have been linked with three midfielders - Chelsea's Nemanja Matic, Ivan Perisic from Inter Milan and Tottenham's Eric Dier. Mourinho said: "I can't say any word about a Chelsea player." However, he added that United "don't have our door closed". "We need more," he said. "We wanted four - 50% of the job is done. We need two more players, at least one. Everything is so difficult." Mourinho confirmed that United tried to sign 24-year-old Spain striker Alvaro Morata last month but could not agree a fee with Real Madrid. Instead, United paid Everton £75m for Belgium striker Romelu Lukaku with manager Mourinho saying his side need a "target man". "We are not speaking about a multi-functional player. He is a striker," said Mourinho, who confirmed his only involvement in the deal came when it was close to completion. "He is not a player who participates a lot in the build-up. We need a target man, which is not Martial or Rashford. "We have good players but we need a number nine. We thought Romelu would be a good option for us." Ibrahimovic's agent Mino Raiola has said the striker will stay in Europe. But both Los Angeles-based Major League Soccer clubs - LA Galaxy and Los Angeles FC - are interested in signing him if he decides to end his career elsewhere. Ibrahimovic said he will make a "big announcement" about his future soon. Mourinho added: "We wanted to let him make a decision - space and time to think and decide. "He didn't want to hide behind an amazing injury. That would be easy. "He was not happy in the way he finished the season. He made the challenge for himself to want to keep playing at highest level. "We opened the door for him to recover with our people and be one of us. It is [executive vice-chairman] Mr Woodward and Zlatan's agent who will deal with it."